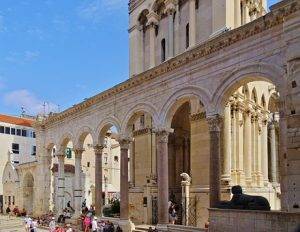 Split Roman Heritage Tour is a unique opportunity for you to take a deep dive into Roman legacy! 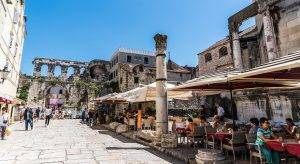 You will explore past of a Roman province of Dalmatia. For this reason your experienced tour guide will have a pleasure of taking you to some marvelous sites. 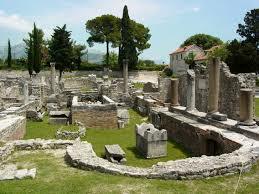 First, this tour will take you to the ruins of the ancient Roman city of Salona. Salona was once the largest roman city on the Adriatic coast. Therefore, at its peak it had more than 60,000 inhabitants. Ancient Greeks settled here in the 3rd century B.C. and established a town. Romans conquered this area in the 1st century BC. On your exploration of Salona you will visit Manastirine burial grounds, Tusculum, walls of Salona, ruins of Salona town. Morover ruins of the Amphitheatre of Salona are waiting for you! After this exciting visit, your next stop will be the Archaeological museum in Split. This is the oldest museum in Croatia. Hence, this museum displays history of Dalmatia, dating from the pre-historical to the early medieval times. In this museum most of the roman artifacts of Salona could be found. Also, some interesting medieval artifacts are part of this museum’s exhibition. Finally, enjoy a guided, walking tour of Split. Learn how an imperial roman palace became a birth place of a modern town. Furthermore, your experienced guide will take you around Diocletian’s Palace. You will also enter St. Domnius Cathedral and Jupiter’s temple (Baptistery of the Cathedral). Mausoleum, a magnificent burial site of the Roman Emperor Diocletian is still there. Today, this building is one of the oldest cathedrals in the world! Also, main highlights of Split will also be presented on this tour. Therefore, you will see Peristil, Vestibul and Central substructures of Diocletian’s Palace. Also, Golden Gate, Statue of Gregory of Nin, Pjaca Square, Renaissance clock tower, Fruit Square, Venetian castle are waiting for you as well! Furthermore – there is no better way to explore Split! You will walk along limestone paved streets and uneven surfaces. Hence, this tour is not recommended for participants with walking difficulties. Also, you would need to make some steps along the way. Therefore, we kindly ask you to wear comfortable walking shoes. This tour includes pickup (by private vehicle) at your hotel in Split area. All admissions are included (Ruins of Salona, Archaeological Museum, Cathedral, Chapel of St. Lucia and Temple of Jupiter). Bottled water is provided for tour participants. Maximum number of participants on this tour is 6 since we try to offer private tour experience. In a case of a bigger group please contact us by the e-mail. This tour might operate in reverse due to operational reasons.